Tender tail-on Shrimp in a crispy pub-style batter. 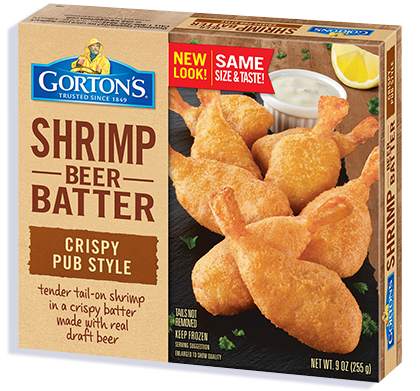 Made with real draft beer for a hearty pub taste, our Crispy Beer Batter Shrimp are as delicious as they are dippable — making them the perfect armchair companion for game day, (or any other day). 3. Bake 16-20 minutes total*. Flip after 10 minutes. INGREDIENTS: Shrimp, batter coating, vegetable oil. Wheat flour, beer (water, barley malt, corn, rice, hops, yeast), water, baking powder (baking soda, sodium aluminum phosphate), salt, sugar, palm oil, colored with paprika and turmeric extracts, whey. 50mg of EPA and DHA Omega-3 fatty acids per serving.